While waiting for an official release of Android 4.2.2 for Galaxy S3, the guys at Sammobile have exclusively got their hands on an Android 4.2.2 Jelly Bean test firmware and were kind enough to pass it to the public. This new firmware brings some exciting new features that can be seen on the Galaxy S4, though some of the more sophisticated ones such as Dual Camera are not yet integrated. But this is just a test firmware so we can expect many more additions to the official firmware. Samsung introduced the Galaxy S4 lockscreen features such as Multiple widgets, Ripple and light unlock effects, a better ripple effect than the one in Android 4.1.2 and the possibility to write a personalized message on the lockscreen. They added Adapt Display and Professional Photo screen modes also from S4. Features such as Daydream, Driving Mode and S-Voice are updated to latest versions. The notification center has been slightly modified. 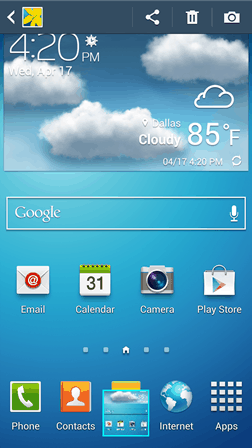 The User Interface is now the same as with the S4. Voice control adds new commands. Added the Smart Switch Widget. And probably other features that are undiscovered for now. !! Before proceeding further, know that installing this will increase your binary counter, but the system status will remain official. Also make sure you know what you are doing because you risk bricking your device, even though the firmware is proven to work really well on the device. First you have to download I9300XXUFME3_I9300OJKFME1_ILO.zip. Unzip the archive. This also includes Odin 3.04. Now run Odin and turn off the device. Reboot in Download Mode (Hold Home + Power + Vol Down simultaneously). Connect your device to the computer with the USB cable (make sure Kies isn’t running and that you have all the USB drivers installed on your PC). In Odin click on PDA and add the I9300XXUFME3_I9300OJKFME1_HOME.tar.md5 file. Do NOT check Re-partition. Click on Start if you have everything ready. Wait a few minutes and that’s it.